Before we do that, however, let’s pause for a moment to consider exactly why these materials are so important. The interesting point here is that brushes and other cleaning tools not only have to clean. They also have to be clean. You can’t, in other words, truly clean a surface with a cleaning tool that’s dirty. The materials used to produce a cleaning tool, along with the tool’s design, have a decisive impact on both factors – how well the tool cleans, and how well it can be kept clean. In the nineteenth century, when Vikan was founded, brushes were made from heads in different types of wood and bristles made from a range of natural fibres, bound together with twine for insertion into holes in the brush head. In those days, before food production was industrialised, the emphasis was on cleaning efficacy, or how well the brush cleaned. And of course “cleaning well” also meant cleaning well for long time, making durability a factor right from the start. The materials that Vikan founder A.P. Pedersen used to produce his first brushes were chosen to suit the exact purpose of the brush in question. Mr Pedersen’s shop kept lots of different natural fibres in stock for the bristles of his brushes and brooms, and the art was selecting the perfect fibre for a scrub brush, a streetsweeper’s broom, a dairy brush and so on. Records show that Mr Pedersen worked with at least four varieties of piassava fibres, along with horse and boar hair – the latter from places as far away as India and China – for finer brushes. By the 1930s, Mr Pedersen’s growing company had its own “mixing” room, where different fibres were combined to serve even more specialised purposes. And during World War II, limited access to foreign markets forced the company to find alternative materials for use as bristles – an early sign of Vikan’s famous powers of innovation. Yet through it all, the constant driving force was a devotion to cleaning tool efficacy and durability. In addition to its range of wood and natural-fibre cleaning tools, Vikan had been producing a small number of plastic brushes since the mid-1960s. Everything changed, however, in the early 1970s, when a scientific study found that walk-in refrigerated areas at a Danish meatpacking plant showed higher levels of bacteria after cleaning than prior to it. This discovery – and a growing general concern with, and ability to measure, food production hygiene – ushered in a new era for Vikan, where cleaning tools had both to clean in the traditional sense, and to be clean in order to clean hygienically. Vikan faced that challenge in the same way it had always done: by looking at the materials the company was using to produce its cleaning tools. In other words, by reconsidering what’s in a brush. The conclusion was that synthetic materials – plastic and nylon – were the way forward, and Vikan charged ahead to produce its revolutionary “White Series” of hygienic brushes for the food and beverage industry. Anyone familiar with Vikan’s product range today can see that the rest is history, so to speak. Vikan is known throughout the world as the leader in hygienic cleaning tools – tools that clean effectively over the long haul and can be kept clean, enabling them to also clean hygienically. An interesting aside in this connection is that sometimes it’s not the materials that are used in a product, but the materials that are no longer used, that make the difference. For instance, by doing away with staples and resin, and using fully moulded bristles instead, our UST range has removed two potential food contaminants from the equation. Today, cleaning tools that come into contact with food are subject to yet another materials-related requirement: food-contact compliance. 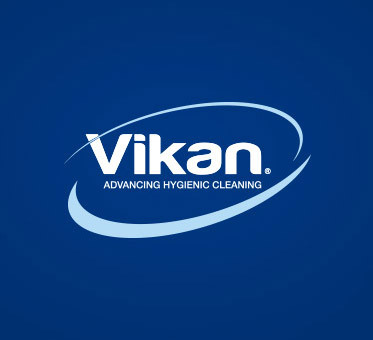 Here too, Vikan is an industry leader, using only food-contact-compliant materials where applicable and, critically, making proof of this compliance readily available on-line in the uniquely detailed Declarations of Compliance we produce for every hygienic cleaning tool we make. In the context of Vikan’s history, the materials we have used – from wood and natural fibres on to plastic, food-contact-compliant plastic and nylon – have played a critical part in our leadership in hygienic cleaning tools for the food and beverages industry.